Edinburgh has had a long history of involvement with the book. Robert Burns went there to get into the big time, and in those days it was the literary capital of the nation (Britain, that is). In the nineteenth century it was the origin point of those magazines which did so much to form literary opinion: Blackwood’s, The Edinburgh Review etc. 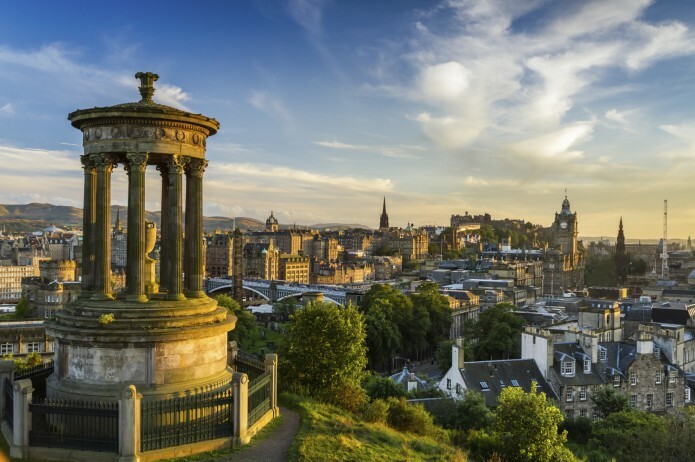 Recently there has been a bit of a renaissance in Scottish literature, centered of course on the capital. None of the poets in Alexander Moffat’s 1980 picture, Poet’s Pub are with us any longer, but the renaissance can certainly take as its founder Hugh MacDiarmid, in the blue suit at the center. 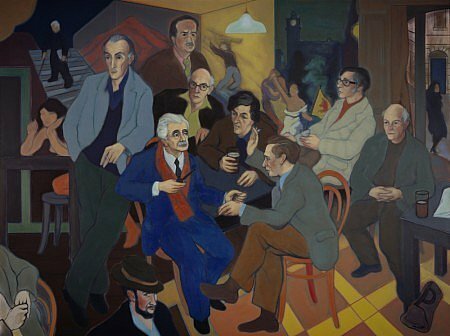 The others, in counterclockwise order from him are Norman MacCaig, Sorley MacLean, Ian Crichton Smith, George Mackay Brown, Sidney Goodsir Smith, then behind, Edwin Morgan, Robert Garioch, and at the front Alan Bold (whom I once met up with myself in another Edinburgh pub). The only other one I ever saw in the flesh was the great man himself, when MacDiarmid came to Cambridge for a reading. The Guardian brings us a story about the creation of an on-line literary map of the city launched on 30 March 2015. The map, LitLong, can be found here. They also provide an app which allows you to walk around the city being informed at every step about what literary events may have occurred there with suitable quotes. Be careful when crossing the streets: this risks being another dangerous means of keeping people’s eyes glued to their iPhones. The City of Literature website is perhaps a little scanty when it comes to Scotland’s contribution to world literature. Surely we could come up with more than Ian Rankin’ Rebus series, The Prime of Miss Jean Brodie, The Heart of Midlothian, 44 Scotland Street and Trainspotting. Well there are actually a few more hidden about the site. BuzzFeed tells us of fifteen Edinburgh bookshops we have to see before we die. And this doesn’t include the two biggies I remember from my childhood, James Thin’s (now a branch of Blackwell’s) and Bauermeister’s (which closed its doors in 2004 after 110 years in business).